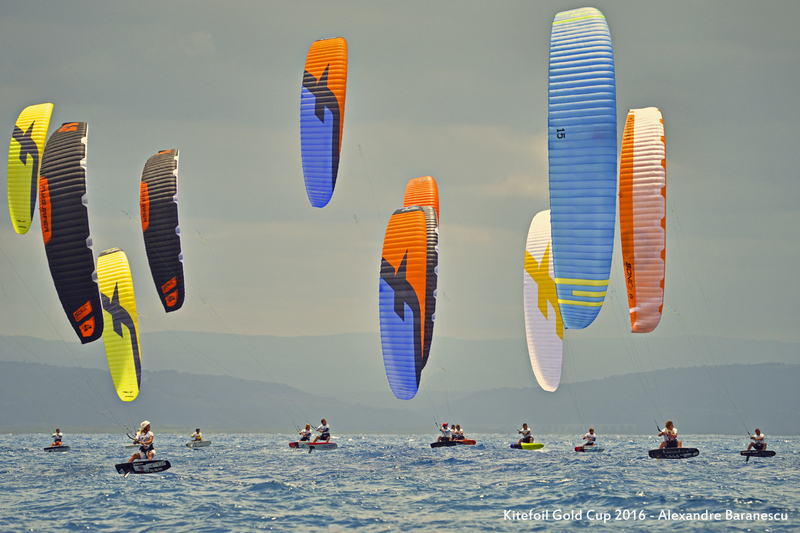 Hang Loose Beach, Gizzeria — The young French rider Axel Mazella showed his class and growing pace at the KiteFoil GoldCup with a string of bullets on a day when all the top racers found themselves competing in the same fleet for the first time. the “gold” fleet’s four races, with even a misstep in the day’s final race when he posted fifth, failing to prevent him topping the leaderboard. For the most part in the difficult gusty and shifty conditions with large waves on the track off Hang Loose Beach, Gizzeria, in southern Italy, he seemed to have the measure of his old foe Maxime Nocher (MON), the reigning International Kiteboarding Association (IKA) KiteFoil GoldCup champion. The Italian-Colombian kite racing veteran Riccardo Leccese also seemed to have few answers to the French teenager’s scorching pace, though the four third places he snatched from four races earned him a solid second place in the standings just ahead of Nocher. Racers, who were divided into three fleets for the medals series on day three of the IKA kitefoil world championships’ opening leg, were forced to wait until mid-afternoon for their first “go” signal because of a vicious shore-break organisers deemed posed a safety risk. But when the wind steadied to around 14kts to 16kts and racing commenced the quality of the talent on display asserted itself with a clutch of stellar performances on the three lapse of the windward-leeward track completed in about 15 minutes. It was not without incident. Briton’s Olly Bridge dropped his Elf Joker foil kite in the unpredictable winds ahead of the “gold” fleet’s second race of the day, could not relaunch and was brought ashore. Luckily his mother, multiple world champion Steph Bridge was waiting with a kite in the air that she handed off to him. He made the start in time, but promptly crashed just afterwards and could not recover sufficiently and posted a disappointing 15th place, in stark contrast to the bullet he scored in the day’s final race. But with the prospect of discards kicking after five races on the competition’s final day on Sunday, Bridge could yet climb the standings from his current fifth place on the leaderboard provided he suffers no further misfortunes. Not that he was alone in suffering ill-luck. Germany’s Florian Gruber posted a series of solid results culminating in a second place finish in the day’s final race that carried him to fourth on the leaderboard. But like others his Levitaz foil caught plastic bags washed on to the track by the stormy, which he had to clear. The lighter conditions than riders had faced on the regatta’s opening two days also suited Adrian Geislinger (AUT) who moved up the standings to 13th spot with several good performances at the start of racing. Among the women, racing with the men in the “silver” fleet, the old order was partially re-established. Reigning Formula kite world champion Elena Kalinina got her nose just in front of Alexia Fancelli (FRA) on the leaderboard, with Jade O’Connor just a few points adrift of them.